Colour management for the desktop is a long standing issue not only for Linux. The following text will concentrate on colour correction of monitors. This means the experience, when you switch your computer or handheld on and look on the screen. Why colour correct the desktop? People tend to compensate for quite a lot of different types of monitors. They are most often able to adapt to one full screen and see colours as they are intended to look like. That’s fine as long as they are concentrated on the visual event on that one display. But in this article we want to discuss how to compensate the monitor colours to our human visual needs in environments with various displays side by side, as is the typical situation for more and more people today. They take pictures with mobile phones or other digital cameras and look at them on laptops, tablets, picture frames, TV sets and printouts often side by side. Or we look at them over the internet and want to share the same visual impression with other people. Many people with uncorrected systems see quite a difference between various colour devices and try to figure out how to conveniently synchronise them. Colour management should help accomplish that task. What is used today on Linux for colour improvements? Different display devices feature different colour gamuts and colour appearance. We are especially sensible to the gray balance. This is a important property for our visual experience. Gray balance is since long time maintained by placing three linear correction curves into the graphics card. They are known as VCGT tag. Properly done, this helps in maintaining a equally stepped gradient from black to white with neutral shades in between. This calibration technic is fast and deployed since a long time by tools like xcalib. Calibration means in ICC terms, to setup a device driver in order to deliver a good and stable colour response. Strictly it is not part of the ICC specification. But for practical reasons it is usually embedded in ICC profiles. This basic calibration with linear curves is still in use on Windows, osX and X11 systems. Different primary colours become more and more an issue through evolving LCD display technology. The above and below CIE shoe diagrams show quite different gamuts between the three primary colours red, green and blue of a typical laptop above and a wide gamut monitor below. It is generally desirable to use a screen, which is able to show deeply saturated colours. But uncorrected images show much shifted colour primaries to better cover human visible colours. Compared to traditional monitor primaries green typical becomes more cyan and red is moved toward the purple line. Of course the same RGB number triple looks quite different on booth devices. A calibration technic like VCGT linear per channel curves can not correct in any way for these saturation and hue shifts. Colours look strange not only on side by side comparisons of such devices. We need a colorimetric description of the monitor to properly colour correct the given device response. Historically we have seen three approaches to cover the colour correction of the full screen. X11 systems are colour management wise much like Windows. They predate ICC colour management and therefore have no historical APIs to enforce throughout colour correction. Maintainance of gray balance through VCGT is possible. The X11 XCMS extension was to our knowledge never in real use. Never APIs can bring a requirement for colour management. Few do today. Differences between corrected and non corrected content on one screen can be very irritating. A very rigorous answer to the situation of missed colour management APIs is a fixed colour correction in hardware. But this can limit the capabilities of monitors to sRGB and thus the experience of wide gamut monitor technology not available. On the other side it provides a way to synchronise tightly controlled display devices. On osX the whole rendering pipe line is colour managed. Each colour must have a colour space assigned to or it is not accepted by the systems graphic APIs. As a result all content from applications is converted on the fly by Apples ColorSync to the according monitor and looks correct. 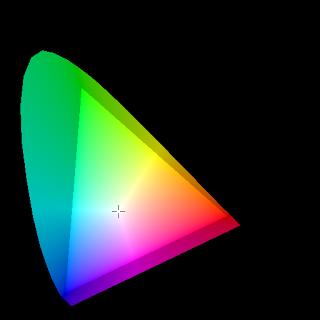 ColorSync takes over the work to bring colours from a source colour space like LStar-RGB to a native destination colour space like from a monitor. This helps programmers to concentrate on their actual task, which is most often not colour management related at all. What is done so far to get the colour correction ball rolling? In 2008 we started a project for OpenICC to do colour correction on the GPU on top of X11. The project allows to colour correct all non colour characterised desktop areas. Non colour characterised means by definition all window regions, except actively marked regions for opt out of system colour management. If no colour managed application is running, this means a full screen colour correction. These non colour characterised regions or areas are handled similar to other non colour characterised content. Such colours are considered to be in sRGB In the printing world for instance. sRGB is the internets default colour space. This approach is a combination of the above outlined ones and an answer to the historical X11 specifics. The advantage is, that legacy APIs and applications can benefit from a colour corrected desktop, while updated applications will be able to opt-out of colour correction. Thus a situation like on osX, with all content clearly characterised, can be reached gradually. During the project was a protocol designed for server client communication. The belonging spec is the X Color Management spec and is maintained by me over OpenICC. The spec was previously called net-color spec, but was renamed due to name space conflicts. For a smooth transition of legacy applications, the implementation of the spec in libXcm contains the xcm tool. This tool allows to set colour regions manually as a workaround. LibXcm covers just the communication protocol for applications and toolkits to talk to a colour server. 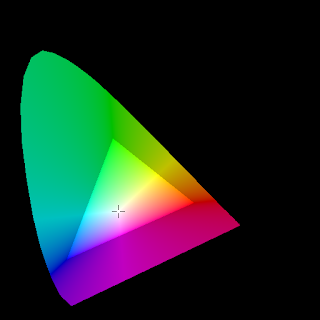 The colour server, for instance CompICC, is responsible for doing the colour correction on GPU. If you want to add a colour server to your favorite compositing window manager or have questions around the spec, get in contact with me. Can the X Color Management spec do compositing? During a discussion on a Qt email list came out the question about compositing and colour correction. Most obviously the spec misses a freely selectable compositing colour space to do full blown up compositing. this would mean blurry region borders and other technics where transparency is involved. That is simply out of scope for the X Color Management spec. It is logical in the responsibility of the compositor to decide about the compositing colour space. Compositing window managers on Linux use today just the plain monitor colour space for their compositing. That is not perfect but seems to be good enough for simple transparency effects. One correct way would be to meld the compositing of the window manager into the compositing of the client, which is in many cases the toolkit. But that is a bold adventure.taking the freedom of toolkits away and making traditionally modular stuff very monolithic. A architectural more sensible approach would be to use an intermediate blending space on top of the X Color Management spec. Thus the blending space is correctly selectable and modularity, interoperability and so on is much better. The toolkit can then rely on the compositing window manager to do all complicated transforms with the provided window and do colour correction as a final step. That would then essentially become a per window colour correction. From a today’s point of view the intermediate per window blending space needs a lot to do inside toolkits. It might take years to get there as toolkits just started about first steps. So the per region colour corrected desktop is still a valuable concept for today’s needs. Future developments have to take into account that the X11 architecture might change and other approaches become possible. The design of new architectures should cover colour management right from the beginning. With Wayland on the horizon and OpenGL-ES this is technically not a problem and would solve legacy issues like we see today in X11, on Windows and all major mobile platforms. This entry was posted in imaging, Oyranos and tagged colour management, Desktop, GPU, ICC, X11 by oyranos. Bookmark the permalink.